This shows that This luny toons should not ever become President! He knows nothing about how to KEEP America strong! Trump is giving them a lesson in Patriotism, but they, of course, could care less. These lefty goof-balls are nuts! As long as Rip Van Winkle Sessions is AG, no swamper has to fear. Back in 1972, then Navy Ltjg John F. Kerry did the same thing to then Republican President Richard Nixon, when he went to Paris and discussed foreign policy with the leaders of Communist North Vietnam. I think it’s very unlikely that Kerry will face any consequences. The swamp (both Democrap and RINO) will protect him. 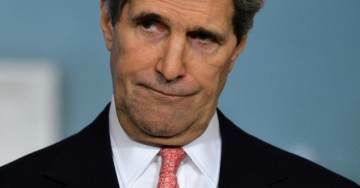 Kerry thinks he’s got legal authority to nation hop everywhere to “pretend” he’s President! But boy, we don’t hear a thing in Congress about all the treasonous activity about any (D)! This is a sure sign of them being in cohorts with the nwo/swamp! As no one says a word! Huckabee now says what others have said:…”Kerry should be held for trial on the Logan Act! Now, we’ll see if these guys in Congress have the guts to follow through with taking down the treason that has gotten away with murder for decades! who is paying for his trips and all that goes with it? Are his antics paid for by taxpayer even now? What about obama stumping for odinga way back when, he’d never of been usurper in chief if anyone had any courage back then. Well, Collette, how did you find this article? And I haven’t had the chance to read all of it, but I am amazed that this could happen! This sounds like something that would happen by the Clintons?! How truthful is this entire matter? And it would now make sense WHY Bush talked about the NWO…AS President! That told us that this treason is for real! No! Kerry Deserves Execution For Treason This Massive Overall! And that makes him “fair game” for being held for Treason! Just to further the insane cause of nwo/swamp, etc.! Kerry Should Be Arrested for Treason, NOW!!!!!!!!!!!!!!!!!!!!!!!!!!!!!!! This means someone who is NOT a part of the Presidential Team…as I read it. Flynn was part of the Presidential Team, so why would they jump all over him? But Kerry is in a different situation. He is NOT and NEVER will be part of any further Presidential Team, due to his treason! For having the gaul to go around Trump and do the treasonous step of trying to help Iran with trying to screw up any discussions Trump had with this vile nation! Only a swamper would pull off a trick like this! Kerry Acts Like He's Transgender...??? And Kerry is trying to find someone to tell them that General is not doing his job???? lol…Patton would have slapped him senseless! With our greatest Doc: The Constitution! Kerry is a good, little r2-d2…! Issue a warrant for his arrest and let him wander in other countries thinking over his stupid acts without any money. And this should include Mueller, since he’s part of the U.D. treason! So I’m wondering why Sessions didn’t have him arrested, and not allowed him to do anything with the investigation he’s involved with right now? And who is supposed to be the one person that can and must round up all these treasonous swampy misfits, in the first place? They are all still walking the streets! But if she was drunk…she could possibly have been mixed up as to who did what…????? She needs to back off, if she’s not correct in whom she is accusing! I’m wondering if anyone can come up with a ancient law that can be used by the Trump Team/Congress, like this is being thought of for Kerry? Cause with all the treason that these lefties seem to enjoy, there should be something that some legal eagle can think of to “drive over” the treasonous tricks in our govt/media? Would Dershowitz know of something like this?